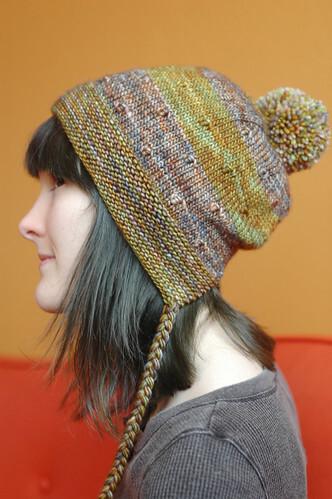 You can check ole Rooty out on Ravelry, here. Don't need to add the 'tooty...' at the end. But root has a different colloquial meaning outside the USA. So I cannot help but call it "rootable," instead of "rooty." I did add the" tooty fresh and fruity" in my head even without you pointing it out. Where does that saying even come from? I think it's something you can order at IHOP... though I don't remember the last time I was at an IHOP, so that's still weird. Ihop has a rooty tooty fresh and fruity... errr.. had? Anyway. Thats what i thought. Such a fun hat! 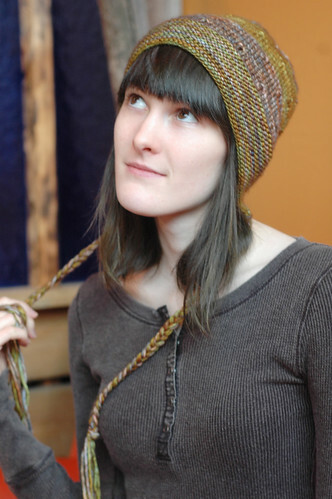 I always love your color/yarn choices and always look forward to seeing your next creation. I really like the colors of the yarn. Nicely done. Yeah, I thought that before getting to the end of your post. I must be the only person on earth who has no association with Rooty Tooty Fresh and Fruity. That's a thing? But I'm also the bum who totally skated over your birthday without even a phone call or text message, so now there's really egg on my face. About the hat -- I am suddenly drawn to those bonnet-y type things, it's adorable and you're hired! It just means you never eat at IHOP, which is probably a good thing. I really dig this hat! Everything about it is great. FYI: I know have "tutti frutti" stuck in my head. 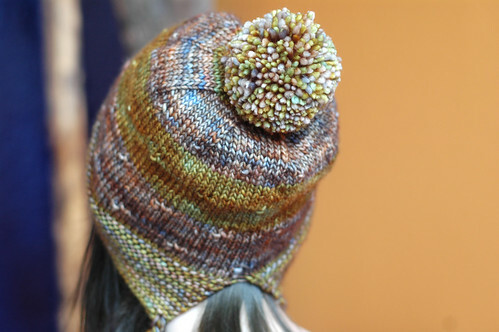 This hat pattern looks great! Good job! The picture of you and all the ladies on the sofa has a little cowl with pom poms sitting on the corner. Do you have this pattern?